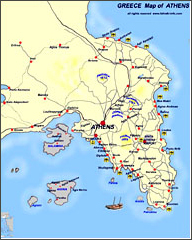 - ZEUS - (6 Days/ 5 Nights) - Athens, Hydra, Aegina, Poros, Delphi & Kalambaka/Meteora. We visit the cosmopolitan Hydra, Aegina, (temple of Aphea) and the picturesque Poros. Lunch is served on board. We drive through Levadia and Arachova to Delphi for a short stop over. We continue through Amphissa, Lamia and Trikala to Kalambaka for dinner and overnight. Morning visit of the breathtaking Meteora and its monasteries built on the top of high rocks. Return to Athens via Thermopylae, (the 300 Spartans) and Kamena Vourla.